It is true that when pride releases energies and serves as a spur to achievement, it can lead to a reconciliation with the self and the attainment of genuine self-esteem. In The Passionate State of Mind (1955), 23. Love is of all stimulants the most powerful. It sharpens the wits like danger, and the memory like hatred; it spurs the will like ambition; it exalts the imagination like hashish; it intoxicates like wine. In novel, Debenham’s Vow (1870, publ. Hurst and Blackett), Vol. 1, 137. In later collections of quotations, the phrase about “imagination” is omitted, for example, in Maturin M. Ballou (ed. ), Edge-Tools of Speech (1886), 284. 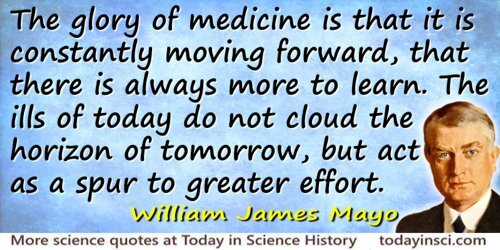 The glory of medicine is that it is constantly moving forward, that there is always more to learn. The ills of today do not cloud the horizon of tomorrow, but act as a spur to greater effort. Address 'The Aims and Ideals of the American Medical Association', collected in Proceedings of the 66th Annual Meeting of the National Education Association of the United States (1928), 163. As cited in epigraph to Thomas M. Habermann (ed. ), Mayo Clinic Internal Medicine Review (2006), Foreward. These Disciplines [mathematics] serve to inure and corroborate the Mind to a constant Diligence in Study; to undergo the Trouble of an attentive Meditation, and cheerfully contend with such Difficulties as lie in the Way. They wholly deliver us from a credulous Simplicity, most strongly fortify us against the Vanity of Scepticism, effectually restrain from a rash Presumption, most easily incline us to a due Assent, perfectly subject us to the Government of right Reason, and inspire us with Resolution to wrestle against the unjust Tyranny of false Prejudices. If the Fancy be unstable and fluctuating, it is to be poized by this Ballast, and steadied by this Anchor, if the Wit be blunt it is sharpened upon this Whetstone; if luxuriant it is pared by this Knife; if headstrong it is restrained by this Bridle; and if dull it is rouzed by this Spur. The Steps are guided by no Lamp more clearly through the dark Mazes of Nature, by no Thread more surely through the intricate Labyrinths of Philosophy, nor lastly is the Bottom of Truth sounded more happily by any other Line. I will not mention how plentiful a Stock of Knowledge the Mind is furnished from these, with what wholesome Food it is nourished, and what sincere Pleasure it enjoys. But if I speak farther, I shall neither be the only Person, nor the first, who affirms it; that while the Mind is abstracted and elevated from sensible Matter, distinctly views pure Forms, conceives the Beauty of Ideas, and investigates the Harmony of Proportions; the Manners themselves are sensibly corrected and improved, the Affections composed and rectified, the Fancy calmed and settled, and the Understanding raised and excited to more divine Contemplations. All which I might defend by Authority, and confirm by the Suffrages of the greatest Philosophers. Prefatory Oration in Mathematical Lectures (1734), xxxi.